It is now obvious that this is kit is more targeted at beginners then as a re-release and we find it a lovely effort to bring youngsters long-time into the hobby compared to the general “Ready to Run” trend which often ends at the first breakage as beginners who didn’t built the kit don’t know or dare to fix it. Also the respect, interest-span and joy of a kit is superior when its self built. This entry was posted in Future Releases on July 29, 2010 by admin. 【 Relive The Fun! 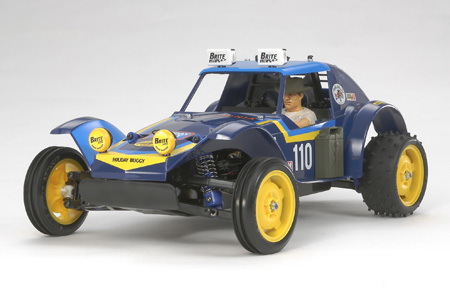 】　The 2WD R/C off-road car Holiday Buggy made its debut in 1980 and attracted many R/C fans due to its sprightly handling characteristics. 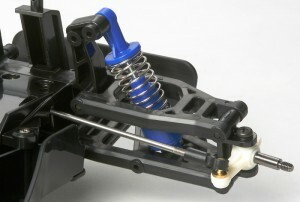 Now, Tamiya is proud to release the updated Holiday Buggy (2010), which comes mounted on the proven DT-02 chassis. It features a 4-wheel double wishbone suspension, and its simple, durable construction makes for easy assembly. 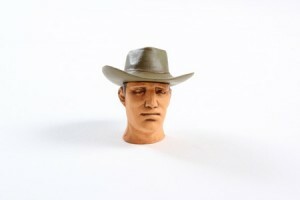 The durable soft resin body features a pre-painted driver figure wearing a cowboy hat for enhanced realism. 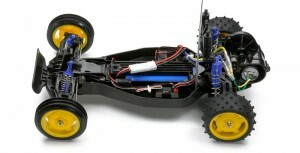 【 Fun-to-Drive DT-02 Chassis 】　The bathtub type frame chassis features a longitudinal battery layout for lower center of gravity and optimum weight distribution. 4-wheel double wishbone suspension is equipped with coil spring damped units to provide superb off-road traction. A sealed gearbox protects against sand and debris and is equipped with differential gears to efficiently transmit the power from the type 380 motor. By installing separately available Type 540 motor and corresponding pinion gear, more powerful driving can be enjoyed. 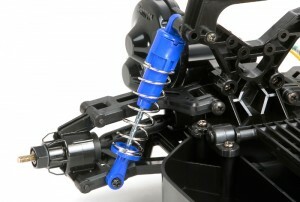 Durable front double wishbone suspension offers smooth movement. Grooved front tires enable superb handling. Rear double wishbone suspension is equipped with spike tires to provide the car with an ample amount of traction. 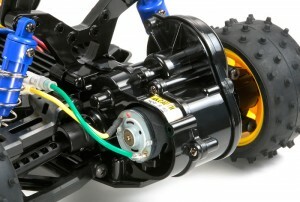 Rear mounted type 380 motor offers a manageable power output. The sealed gearbox is equipped with differential gears. 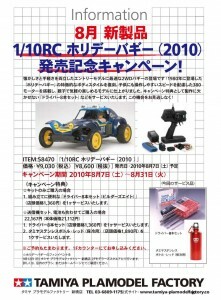 August 07 (Saturday) will debut a new product “1/10RC Holiday Buggy (2010),” done to celebrate the launch of the campaign. 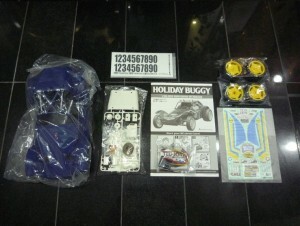 2-wheel drive buggy to enjoy off-road driving feel from the road, “Holiday Buggy” Why not start life in RC. Please please take this opportunity to purchase. – Eight AA alkaline batteries for transmitter. 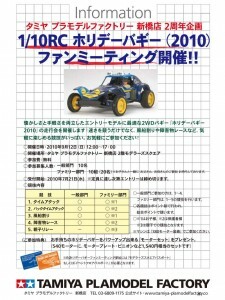 Ideal entry-level models of both the convenience and nostalgia 2WD buggy “2010 Holiday Buggy” (to be released August 07) in our shop for you to enjoy the charm of the division balloons and Time Attack, fun and obstacle race. Holiday Buggy fan meeting we planned. Customers can participate in the Holiday Buggy power motor set for free! We offer you the General Division and Family Division. Please feel free to join us in like family in person! 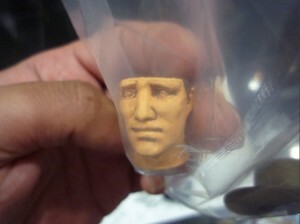 ※ ★ ☆ reception is July 21 (Wednesday) to accept. Deadline ★ ☆: Please let me Once it’s closed capacity. 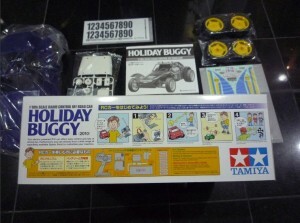 Benefits Join ★ ☆: Holiday Buggy can power up your existing set “motor” will be to award. Join ★ ☆ machine event the “380 motor mounted” thank you on. This entry was posted in Event Report, Future Releases on July 23, 2010 by admin. 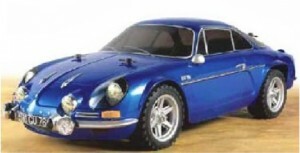 The Tamiya Renault Alpine A110 is another rally classic radio control car based on the M-05Ra chassis in 1/10 scale. This entry was posted in Future Releases on July 16, 2010 by admin. 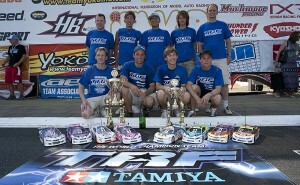 Two world championship titles in a row for Tamiya and Marc Rheinhard! 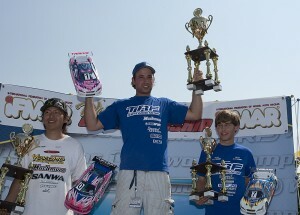 Marc Rheinard & TRF416X win 2010 IFMAR ISTC World Championship! The 2010 IFMAR ISTC Electric Touring Car World Championships were held from July 1st-3rd in Burgdorf (near Hannover) in Germany. Tamiya Racing Factory (TRF) was there in force, with Marc Rheinard laying down the gauntlet by taking the top qualifying position with his TRF416X. He then took full advantage by winning the first two A-Main heats to claim the world championship title. Having won the title in Thailand back in 2008, this win makes it two titles in a row for Marc and is also his third overall. 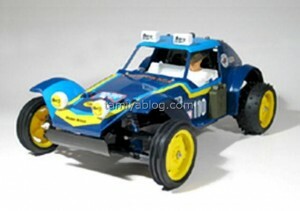 This is also Tamiya’s fourth world championship title, following wins in 2002, 2004, and 2008. Other TRF drivers also put in strong performances, with Elliott Harper taking 3rd place on a tie-break, Jilles Groskamp taking 6th place, and Viktor Wilck taking 10th place, thus giving Tamiya four Top-10 finishers! Please continue to give your support to Team TRF and their machines in the races to come! This entry was posted in Event Report on July 9, 2010 by admin. 【 Relive The Fun! 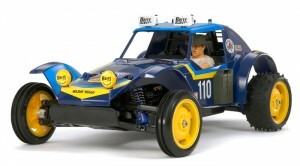 】　The 2WD R/C off-road car Holiday Buggy made its debut in 1980 and attracted many R/C fans due to its sprightly handling characteristics. 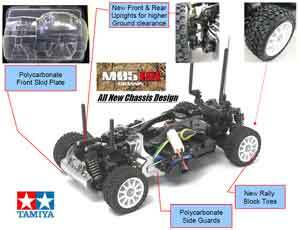 Now, Tamiya is proud to release the updated Holiday Buggy (2010), which comes mounted on the proven DT-02 chassis. It features a 4-wheel double wishbone suspension and a sealed gearbox equipped with differential gears, and its simple, durable construction makes for easy assembly. Type 380 motor included. ※More information will follow soon, so keep watching this site for the latest updates regarding this product! 【 Holiday Buggy Fan Meeting! 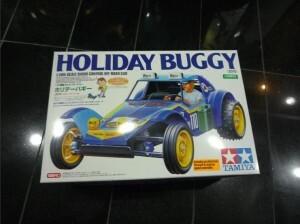 】　On September 12th (Sun), the Holiday Buggy Fan Meeting will be taking place at the Modelers Square on the 2nd floor of the Tamiya Plamodel Factory in Shimbashi. The event includes a family race and is ideal for R/C beginners to attend. This entry was posted in Future Releases, Media on July 2, 2010 by admin.